Solnhofen is known all over the world for its Jurassic limestone slabs and its fossils. It is one of the most southerly towns in the rural district of Weißenburg-Gunzenhausen and is situated on both sides of the Altmühl River. The town of Solnhofen was founded by an Anglo-Saxon monk named SOLA, who was sent to the Altmühl area in 750 A.D. from the monastery of Fulda. He was to convert the pagan Germanic tribes to Christianity. As he started his missionary work there, he lived in a rock cave, the so called "Sola cave". We can still see remnants of this on the edge of the hill high above Solnhofen (Käppleinsberg). Sola founded a farm on the right side of the Altmühl: The name of the town came from the word "Solahuf". Charlemagne gave Sola the Iand around his farm as a reward for his help during the construction of the "Fossa Carolina" The monk died in 794 A.D., bequeathing his property to the monastery at Fulda. The monks there built him a tomb and later (825 A.D.) a basilica was erected over the spot. Later again they added a church and monastery. The basilica, one of the oldest architectural masterpieces in Germany, with its Carolingian columns has been preserved until now. In Solnhofen there is also a memorial to the inventor of lithography, Alois Senefelder, who was responsible for the development of the Solnhofen quarries. People have been working in the quarries for many years now, winter in and summer out, often under shelters against rain, sun or snow. The stone slabs are split by means of picks and chisels, even small hoes. Each of the slabs is marked with coal into its rectangular or square shapes and then hacked out with a hammer. Prepared slabs used to be loaded onto small carriages and were rolled into the work areas. Nowadays fork-lifts and trucks are performing this transport work. In the plants there will be found modern machines and skilled personal cut and round the edges of the slabs, which are often polished. Lorries now transport them everywhere, a job the railways performed earlier. Jurassic limestone slabs are found between Langenaltheim and Kehlheim, an area with 100 km length and 30 km width. The main reserves lie near Solnhofen, Mörnsheim and in the Eichstätt area. According to scientific research, the deposits were probably formed in the following way. During the Mesozoic Age (about 110 - 160 million years ago), the region of Southern Germany and most of Central Europe was covered by sea. Lagoons are supposed to have formed coral reefs by the coastal areas of this sea. Limestone mud was carried down onto these reefs by the sea currents and deposited there. Even more likely however, is another theory, that vast areas of flat land were covered by periodical floods, and that the water kept flowing back, leaving lime sediments within the land basin. The Solnhofen limestone slabs probably owe their unique quality to the dry period between the floods. For if the lagoons had constantly been exposed to the sea, the limestone sediments would no doubt have formed massive blocks offstage. When the sea flooded the land, sea animals and plants were carried into the lagoons. They remained embedded in the mud when the water flowed, back. Further flood brought in more lime mud and this developed layer upon layer. Embedded between or in the layers themselves are not only each plants and animals, but also mainland ones, and even insects and other flying animals. In the course of millions of years, the mud hardened and petrified. These petrified remnants of the past reveal to us, the history of our planet and its creatures as they were 150 million years ago. 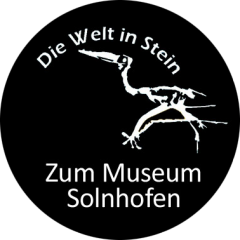 More than 40 years ago the present Mayor of Solnhofen, Friedrich Müller, began to collect, to prepare and to classify fossils found in the limestone slabs of Solnhofen and its surroundings. Over the years a collection was built up, which bears witness to an epoch long since past. It includes almost all kinds of fossils found in the Solnhofen quarries. In the museum we can find Cephalopoda, spinous animals, insects, fish, plants, jeIly-fish, medusa, crabs, turtles and reptiles. A geological cross-section is also represented, which shows a variety of geological formations as well as the evolution of life from the Cambrian age, about 560 million years ago, via the Silur, Devon, Carbon, Perm, Trias, Jurassic, Chalk and Tertiary formations. Cephalopoda: It is worth mentioning a large ten armed octopus, 1 m long and with a tremendous body that thins out towards the back and ends in two fins (Lepto-teuthis-gigaw) The ink pouch is often well-preserved, and even the dry and petrified ink matter is sometimes still in quite good condition. An ammonite, embedded in a vertical position with marvelous limestone minerals is a special feature ' of this group. Spinous animals: Outstanding in this group are Orphiurella speciosa and sea lilies, such as Antedon pinatus. Insects: We would like to mention grasshoppers, wasps, beetles, and water-bugs, especially the dragon-fly with a wing?span of 21 cm. Fish: There is a large collection of rare and beautiful fish such as a well preserved scale-fish 112 cm long, a cartilage fish, (Caturus maximus 150 cm long and 55 cm high, a titan fish, (Girodus titanius) 95 cm long and 70 cm high. The rounded teeth are almost complete. There is also an Orthocormus cornutus 145 cm long which has definite shark characteristics e.g. uneven fins on the tail and typical shark teeth. We can also see an Undina acutidens 25 cm long an intermediary form between sea and land animals. It was declared extinct but it was rediscovered near Madagascar in 1938 and again in 1952. It is therefore called a living fossil. Crabs: We should mention the Aeger tipularius, a crab with six long feelers and ten legs, and Limulus walchi (arrow-tail crab), even a trace of its movement in stone. Saurians: This is the most valuable and rarest group and excellent examples of it can be found in the museum, e.g. the Homoeosaurus sp. a small lizard; Pleurosaurus goldfussi (crocodile type); this is a saurian 90 cm long and very rare; Plesiosaurus (sea lizard), over 2 m long; unfortunately only the spine is still preserved; the short-tailed flying lizards, Pterodactylus antiquus and Pterodactylus kochi ? these get their names from the two flying fingers, which can be considered as extensions of the claw and which used to be covered by a webbed skin and finally the flying lizard Rhamphorhynchus gemmingi (beak muzzled) which sometimes grew to a wing span of more than 150 cm, of which there are a number of well preserved examples. Turtles: A fossilized turtle, the Eurysterum wagleri, is an extremely rare and well preserved find, which the collector praised from the stone in one night. Prehistoric birds: The Archaeopteryx lithographic and the Archaeopteryx ab simensi are both to be seen in plaster casts. The first find (lithographic) was made in 1861 in Haardt near Solnhofen, 20 m underground. The country doctor Haeberlein acquired this valuable find and sold it to the British Museum in London. The second find of 1877 (ab simensi) came from a quarry on the Blumenberg near Eichstätt and was sold at that time for 20.000 gold marks, offered by Werner von Siemens on behalf of the Humboldt University of Berlin. Werner von Siemens sponsored this acquisition in order to preserve this valuable find for German science. The prehistory bird was the first find of a fossilized bird which retains many characteristics of reptiles. The most important of these are: teeth, claws on the flying joints, and a spine which extends into the tail. The collection is completed by a group of sea lilies (Pentacrinus) and an Ichthyosaurus (240 cm long) from Holzmaden, (Lias, black Jurassic type). Sea crocodile: In the year 2008 there was found a spectacular fossil in the area of the town Painten. This exceptional crocodile, which is exposed in the Bürgermeister-Müller-Museum since the 20th of June 2008, could be the most perfect and most beautiful crocodile of Solnhofen from the Jurassic time, 150 Million years ago. Dr. Martin Röper points out the inimitable conservation of the complete „Geosaurus". He denotes the sea crocodile as the "main important fossil of the museum after finding the Archaeopteryx".